cooking for foodies using coconut | We are what we eat! You can’t polish a coconut – or can you? I make a prediction: coconut is about to have its day and not just on exotic far-flung islands. Last week, I posted a recipe for coconut pancakes that had everyone swooning and this week, I noticed that SmittenKitchen has a so-sweet-it-could-crack-a-tooth recipe for coconut milk fudge. My own backyard brewery, Kona Brewery launched a coconut beer over the winter months that was so popular, last I heard, they were considering making it a regular offering. Further, you watch, now that Coca-cola has bought into the coconut water world, you’ll start seeing it everywhere. Starting right here — on this blog. I’m just waiting for Oprah to scoop me on this one..you know, the next miracle food. Just remember where you heard it first. So what’s a foodie to make of this slightly gorilla-looking “nut” of the tropical variety? As you probably guessed by my foreshadowing quotes, coconuts aren’t nuts at all; they are drupes, like mangoes and olives. From an eating perspective, coconut meat is disappointingly plain tasting and the water itself is a bit bitter. I’ve often wondered, “how hungry WAS that guy who broke into a coconut?” Its actually a really fascinating food, not just for where it grows (in the USA: Hawaii and Florida only) or what botanical family is from, or even what new and cool beverages are showcasing the coconut. Apparently this drupe is no rube – he gets around. Coconut milk, coconut water and coconut meat can and are used in a variety of Polynesian, Caribbean, and even eastern Indian cooking. The coconut milk adds a mild, fuller flavor to just about any food. We sometimes use 1/2 water and 1/2 coconut milk in our rice (see below for a MUCH better version). The meat’s texture distinctive and meaty, and can be enjoyed raw or cooked. Coconut flour is used as a low-carb, gluten-free alternative to regular flour and coconut oil is very stable, making it a great frying oil and it is completely safe when heated. Given its many uses, its surprising that more of the northern hemisphere hasn’t caught on sooner. From a health perspective, the hairy drupe with a poor reputation can be used for a variety of applications. It turns out that coconut, besides relieving stress by conjuring up island images, is quite good for your health, treating everything from dry skin to anxiety issues and even weight loss. One of the most amazing things I learned while doing some research on this topic, was the fact that coconut water is the universal blood donor; it can actually be used safely in human blood transfusions. Please tell me you aren’t amazed by that fact. 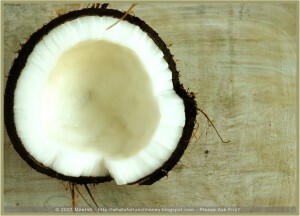 Natural, real coconut is not the sticky-gooey-over-processed flakes that we are so used to seeing. At our house, we are starting to use more coconut oil in our cooking. At first, I was afraid (..I was petrified), because despite my passion for my coconut-banana pancakes, I don’t really like overly-coconut flavors. But the oil itself is quite mild, we tried it out on tofu just to see how much the flavor was absorbed, and it turned out great. I wouldn’t say that it will entirely replace EVOO at our house, but we will continue to use it more and more. I’ll keep you updated as we progress. In this simple, alluring dish, smashed ginger perfumes the rich, coconut milk–based cooking liquid, which in turn gives the brown jasmine rice a rich, velvety texture. In Indonesia, coconut rice is often garnished with crisp fried shallots, which provide a crunchy counterpoint to the soft, creamy rice. For a recipe for crisp fried shallots go to saveur.com/crispyshallots. 1. Using the back of a large knife, pound the ginger until it becomes bruised and somewhat stringy and releases some of is juice. This will take a few good whacks. 2. Rinse the rice in a strainer under cold running water for 30 seconds. Transfer the rice to a 1 1⁄2-quart saucepan and add the coconut milk, 3⁄4 cup cold water, and the salt. 4. Allow the rice to boil for 15 seconds, while continuing to stir. Reduce the heat to medium-low and simmer, covered, until the liquid is completely absorbed and rice is tender, about 45 minutes. Remove the pot from heat; allow the rice to continue to steam, covered, for 10 minutes. Fluff rice with a fork and garnish with sprigs of cilantro. My jaw truly dropped. I didn’t know any of this especially about the universal blood donor. The tooth-cracking recipe for coconut milk fudge is definitely and forever embedded in my psyche. Great, great post. Thanks, PT. I know, isn’t that recipe for coconut milk fudge to die-for. Leave it to SmittenKitchen! Thanks for reading..AND commenting! Dear Tara – God forbid we never need one of those but boy am I going to store away that golden nugget of info for the PMT if I ever need a blood transfusion – forget the blood man, go find an effin coconut! I loved the amount of research you did on the subject and honestly I can do without the fudge – I’ll take your rice any day. BTW, the secret to drinking coconut water is it must be from a young coconit. Once the nut is brown, too late. Back in Mumbai, it was one of the favorite things Mum & I used to do – walk to the sea shore and buy us each a coconut, dangling our feet over the edge of the boardwalk. Good times…. A visit to your blog is always a pleasure! OK I must be doing something wrong as I cant open the pancakes nor the fudge recipes!! I LOVE coconut and would love to try to make them!! Thank for the rice recipe though I will be making it tonight!!! @Maureen: Here are the links to the two recipes. THANK YOU for pointing out that they were dead and THANK YOU for reading! @Devaki – wouldn’t you just looooooove to have coconut pumping through your veins! And thank you for sharing the secret for drinking coconut water. For the first time this weekend I bought some at the store; I liked it. I could see drinking it regularly, especially after a workout. I think you should write a blog about Mumbai…I’d like to “go” there with you. Thank you for always stopping by! Hey Tara, I’m with you on the coconut thing. It’s such a perfect food despite it being demonized for so long. A good nut with a heavy fat that has neither cholesterol or trans fats (unless they hydrogenate it, which is unnecessary). Oh, and people are surely crazy over it. My first post that I actually posted on FB was number one the next day on the Top 9 all day long-it was a mango and coconut cake (smile)!!! Since then, no # 1s. Maybe I need to make something with coconut again!!! @Stella – you got it girl, coconut is coming back! I think its interesting that your blog post about mango coconut cake was number one…you must have been ahead of your time! Thank you so much for stopping by, I hope you’ll continue to do so! Wow! I didn’t know any of that about cocoanuts! Cocoanutwater is the only natural substance I now know of apart from coral (used in bone replacement therapy) that the human body can use in a manner other than nurishment or vitamin producing activity. My Grandfather used to open a cocoanut as a rare treat when I was little–I still can’t seem to do it as we’ll as he can! @Mattheous – it takes quite a bit of style to open a coconut! I think it fun that your Grandfather used to do that!